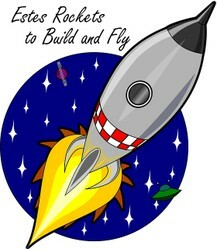 It is so simple to build and fly your own rockets, and Estes makes many to choose from. I am the parent of three boys and my boys had a great time building and flying their Estes rockets. These model rockets have been around for quite a while. I'm not sure how long, but my oldest son was flying them about twenty-five years ago. The beginner kits contain easy to assemble rocket parts to be glued together and assembled for lift off. More experienced builders, and older kids may want to try a more involved model. Other items will be needed, such as the launch pad and engines. The only other necessary thing to have would be lots of wide open space. The rockets themselves can be inexpensive or more expensive and have varying characteristics but the idea is to have fun and my boys spent a lot of fun hours watching their Estes rockets fly. Of course finding them once they land is always fun too. You'll need some wide open spaces to fly these rockets. Many parents say that it is a sad turn of events that our kids, and especially teens, spend far too much time indoors sitting in front of a television or computer playing video games. The model rockets made by Estes are easy and fun to build, but that is only the beginning. Once the model is put together, it will actually fly up - and I mean way up - into the air. Kids will need help with the launching part as the engines need to be lit by an adult, but the activity is safe and fun. If you don't have a large, treeless backyard, find a park or schoolyard to launch these rockets as they will need lots of space to not only fly, but some of them come down slowly and any wind at all will cause them to drift into unwanted areas. From the maker of the rockets. This set comes with two model rockets and a launch pad. You will still need to buy accessories. 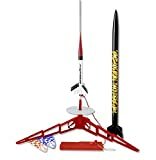 Although this is a great beginner set it is not complete and more accessories will need to be purchased to shoot the rockets into space - the air. You will also need engines (different sizes for each of the rockets - see above) and AA batteries for the launch controller. There is a large block of text to explain the Tandem Launch set on the product page at Amazon so be sure to read through it carefully. The larger rocket is almost three feet tall and the launcher comes with it! Everything doesn't always go right! First of all, I suggest that you have more than one rocket available. If something happens to the rocket your son just spent an hour putting together, he may get discouraged if that was it. No more rockets to try. This is an activity that will have to involve parents, or some adult. It's a great way for dads and their sons to spend time, but truthfully, when it was launch time at my house, we all went outside to watch and help chase the rocket down upon landing. Be prepared for failure, but kids have to learn to deal with that too. For beginners and younger kids start with the least expensive rockets which will probably also be the easiest to assemble. There is always a chance that the rocket will get stuck in a tree on the way down or crash and break if the parachute does not open. For this reason, don't get too attached to any of your rockets and have at least one spare handy. Fly them on a day that is not too windy. Some of these models go up very high and it could be more windy up there than at ground level. Give yourself lots of wide open space since they come down slowly with the parachute attached. Choose the correct engine size recommended for each of the rockets. On the Estes site you can read comments about each design and find out what features give the rockets their skill level. Mostly it is the difficulty in building the model. It protects the parachute and keeps it from catching on fire. There are some little things that will be needed for every flight. 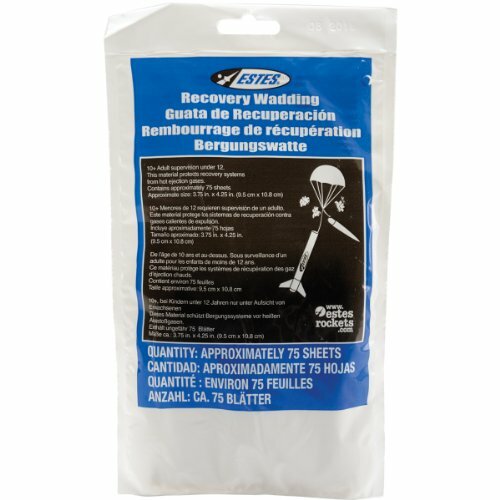 One such item is the Estes Recovery Wadding. This is flame retardant material that will be added to the rocket before launch. Amazon's customer reviews of this item say that other, less expensive material can be purchased from local stores, but each pack of the Estes brand is good for 18-25 flights, with 75 pieces per package. You be the judge. You must have this, or something like it in order to make your rocket fly correctly. Are you hooked on flying model rockets? I'd love to see more boys doing this kind of thing. That is why I think we still need Cub Scouts! Oh wow, this brings back memories! When my boys were in Cub Scouts, they worked on building Estes model rockets, and set them off at the spring Cub Scout picnic. It is so much fun, for the whole family - and not really expensive. Thank you for reading. Mi little boy will love these. Thanks for the great idea! I agree 2uesday. They really are a lot of fun. Zipper neckties are the best solution for putting a necktie on a squirming boy!